Java How To Program (Early Objects) 10 Edition Note: You are purchasing a standalone product; MyProgrammingLab does not come packaged with this content. If you would like to purchase both the physical text and MyProgrammingLab search for ISBN-10: 0133813436 / ISBN-13: 9780133813432. That package includes ISBN-10: 0133807800 / ISBN-13: 9780133807806 and ISBN-10: 0133811905 / ISBN-13: 9780133811902. MyProgrammingLab is not a self-paced technology and should only be purchased when required by an instructor. MyProgrammingLab should only be purchased when required by an instructor. 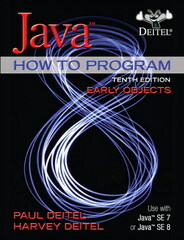 Java How to Program (Early Objects) , Tenth Edition is intended for use in the Java programming course. It also serves as a useful reference and self-study tutorial to Java programming. The Deitels’ groundbreaking How to Program series offers unparalleled breadth and depth of object-oriented programming concepts and intermediate-level topics for further study. Java How to Program (Early Objects), Tenth Edition, teaches programming by presenting the concepts in the context of full working programs and takes an early-objects approach( MyProgrammingLab for Java How to Program (Early Objects) is a total learning package. MyProgrammingLab is an online homework, tutorial, and assessment program that truly engages students in learning. It helps students better prepare for class, quizzes, and exams–resulting in better performance in the course–and provides educators a dynamic set of tools for gauging individual and class progress. Teaching and Learning Experience This program presents a better teaching and learning experience–for you and your students. • Personalize Learning with MyProgrammingLab: Through the power of practice and immediate personalized feedback, MyProgrammingLab helps students fully grasp the logic, semantics, and syntax of programming.• Teach Programming with the Deitels’ Signature Live Code Approach: Java language features are introduced with thousands of lines of code in hundreds of complete working programs.• Introduce Objects Early: Presenting objects and classes early gets students “thinking about objects” immediately and mastering these concepts more thoroughly.• Keep Your Course Current: This edition can be used with Java SE 7 or Java SE 8, and is up-to-date with the latest technologies and advancements.• Facilitate Learning with Outstanding Applied Pedagogy: Making a Difference exercise sets, projects, and hundreds of valuable programming tips help students apply concepts. • Support Instructors and Students: Student and instructor resources are available to expand on the topics presented in the text.